There were still bargains at auction today. 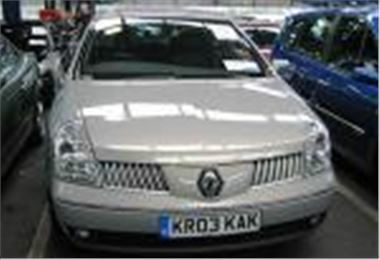 Not least this 42k mile 03 reg Vel Satis 3.0V6 DCI Initiale auto with leather that sold for £9,250. (A living room on wheels for the price of a good sofa.) Also a 42k mile 04 reg BMW Z4 2.2SE auto roadster sold for £15,400, a 12k mile 05 reg SAAB 9-3 1.8T Linear convertible sold for £15,700, a 21k mile 2003/53 MGTF 160 sold for £6,100, a 99k mile 02 reg VW Passat TDI PD 100 estate sold for £4,750, and a 72k mile 2000X blinged up Focus 2.0 Zetec sold for £2,700. But many other sales and provisionals looked to be like they were rising. Jeep Cherokee 2.4 Sport, 04 reg, 10k miles £12,800p? Light Commercials from Dagenham Motors, Royal Mail, Bank of Scotland, Lloyds TSB, Lex Vehicle Leasing, Northgate, Fleet Direct, Lombard. Fleet & Finance, LTSB Autolease, Leaseplan, Motability, Citroen UK, Vauxhall Leasing, Masterlease, Hitachi Capital, General, Private Direct, Inchcape p/x. Top Car, Black Horse top cars, Porsche Retail p/x, Motability, Lex Vehicle Leasing, Inchcape no reserve p/x, Reg Vardy p/x, Hartwell p/x, Pendragon p/x, Franchised Dealer p/x, West London Nissan p/x. Fleet & Finance, LTSB Autolease, Leaseplan, Motability, Lex Vehicle Leasing, Citroen UK, Bank of Scotland, Hitachi Capital Peugeot, General, Peugeot Charters p/x, Inchcape p/x. Fleet & Finance, Bank of Scotland, Motability, Porsche p/x, Lex Vehicle Leasing, Inchcape no reserve p/x, Reg Vardy p/x, Hartwell p/x, Pendragon p/x, Franchised Dealer p/x, West London Nissan p/x. Fleet & Finance, Hitachi, Renault Financial Services, Lex Vehicle Leasing, Jardine p/x, Leaseplan, Black Horse, General, Ridgeway Group p/x, Snows Group p/x, Jardine Group p/x, Trident Honda p/x. Fleet & Finance, LTSB Autolease, Leaseplan, Motability, Lex Vehicle Leasing, Citroen UK, Vauxhall Leasing, Masterlease, Hitachi Capital, General, Peugeot Charters p/x, Private Direct, Inchcape p/x. Top Car, Black Horse top cars, Porsche Retail p/x, Fleet & Finance, Motability, Lex Vehicle Leasing, Inchcape no reserve p/x, Reg Vardy p/x, Hartwell p/x, Pendragon p/x, Franchised Dealer p/x, West London Nissan p/x. Fleet & Finance, LTSB Autolease, Leaseplan, Motability, Lex Vehicle Leasing, Bank of Scotland, Hitachi Capital Peugeot, General, Peugeot Charters p/x, Inchcape p/x. Fleet & Finance, Motability, Porsche p/x, Lex Vehicle Leasing, Inchcape no reserve p/x, Reg Vardy p/x, Hartwell p/x, Pendragon p/x, Franchised Dealer p/x, West London Nissan p/x.